Hampshire are heading to Spain to prepare for the upcoming campaign. And the Ageas Bowl side will play two warm-up matches against Northamptonshire as part of their pre-season tour. A 23-strong party jet off to La Manga Club Sports & Leisure resort, Murcia, on Thursday, March 7 for a week-long training programme. It will consist of outdoor training and strength & conditioning before facing Northamptonshire in two 50-over matches. Giles White was impressed with the facilities at La Manga Club when he visited in October. The director of cricket revealed the club have sent out a groundsman to help with the wickets in Spain in preparation. And he feels the trip will set his side up well for the 2019 campaign. White said: ‘We really enjoyed our time over in Barbados in previous years and have a lot of great memories but we’re looking forward now after choosing to go to La Manga Club. I visited the resort in October and was really impressed with what I saw, it’s a fantastic facility and everything suggests it will be a really beneficial visit. ‘Each time we go on these trips, they’re relatively short but you want to maximise what you can get out of it in terms of cricket. ‘The practice and playing facilities, accommodation and travel are logistically good and we’ll look to get as much cricket in as we can in that time, ahead of coming back to the Ageas Bowl where hopefully the wickets will be in good shape if we have kind weather in March. ‘We’ve currently got a groundsman helping out with the wickets so there’s a nice connection already too. 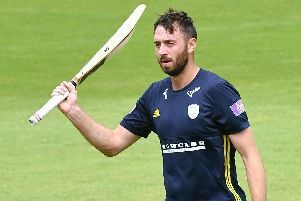 Hampshire open their season with a County Championship division one clash against Essex at the Ageas Bowl on April 5.